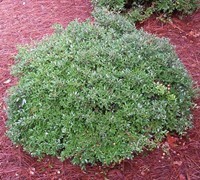 Schillings Dwarf Yaupon is a handsome evergreen, mounding shrub that is perfect for home foundation plantings. It grows to about 3-4 feet in height with a spread of about 5 to 6 feet though can be sheared to maintain a smaller size. Exceptionally hardy and long-lived. Schillings Dwarf Yaupon is useful in foundation plantings where it can be left to grow to it's natural, mounding form or sheared into more formal shapes. It is also useful as a low hedge, under mid-size trees, in small groupings, or in mass on slopes. Schillings Dwarf Yaupon is easy to grow in locations that provide well-drained to somewhat moist, acidic soil and full sun to light shade. It is drought tolerant when established only requiring supplemental irrigation during prolonged periods of drought during summer. Though it will naturally form a mound on its own you can shear it occasionally for a more formal shape.